← Pianist Found Not Guilty Of Noise Pollution & Psychological Distress! The Royal Liverpool Philharmonic Orchestra are working exclusively with the hugely talented conductor Andrew Manze over the next two weeks. We are having a series of two week ‘Artist-In Residency’ programming slots this season. We have had Bryn Terfel already, it is Andrew Manze’s turn now: Simon Trpceski and Christian Lindberg will be appearing in the new year. Andrew Manze has elected to play music which was written by Benjamin Britten, music which inspired Benjamin Britten or music that Britten simply loved. It is the Benjamin Britten Centenary celebrations just now. We have Mozart 40, Mahler 4, some Purcell, some pieces by Britten, Schumann & Schubert. Manze, who is also a famous violinist, noted especially for his baroque interpretations, has become a regular RLPO visitor as a conductor over the last few years. A cartoon on the 1st trumpet part of Andrew Manze’s own set of Beethoven 3. Not a bad likeness! A very exciting fortnight’s work in store! The previous year’s appearance with the RLPO by Andrew had to be cancelled and reschedules, due to a power cut in the local area to Philharmonic Hall! Unfortunately, this time, no sooner did the last note of Mahler 4 taper off after a particularly fine performance then the fire alarm erupted, not allowing us or the audience an opportunity to enjoy the applause. Oh well, these things do happen very rarely. 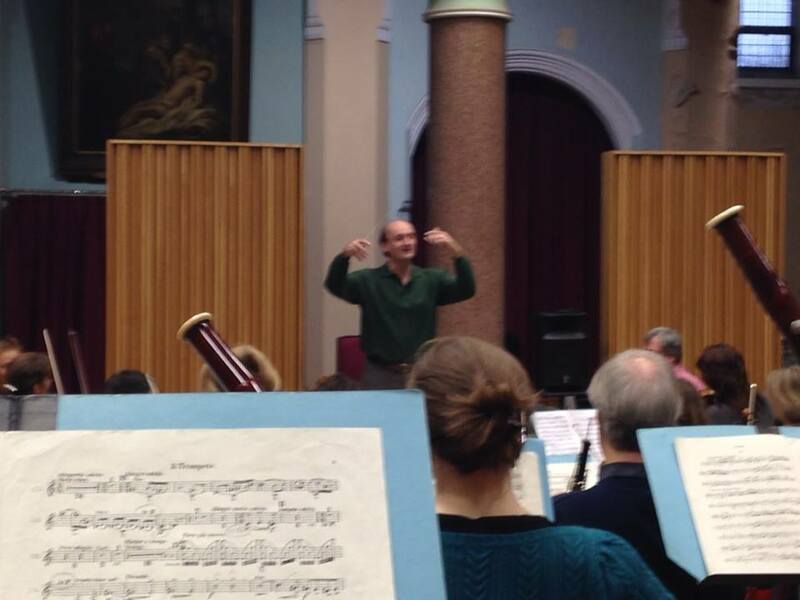 Here’s looking forward to this week’s tremendous concerts with Andrew Manze. The second of the RLPO’s four residences this season has brought Andrew Manze – formerly known as the Paganini of the Baroque Violin – to conduct two programmes associated with the Britten centenary. The second of these was built around composers close to Britten’s heart rather than his own music. 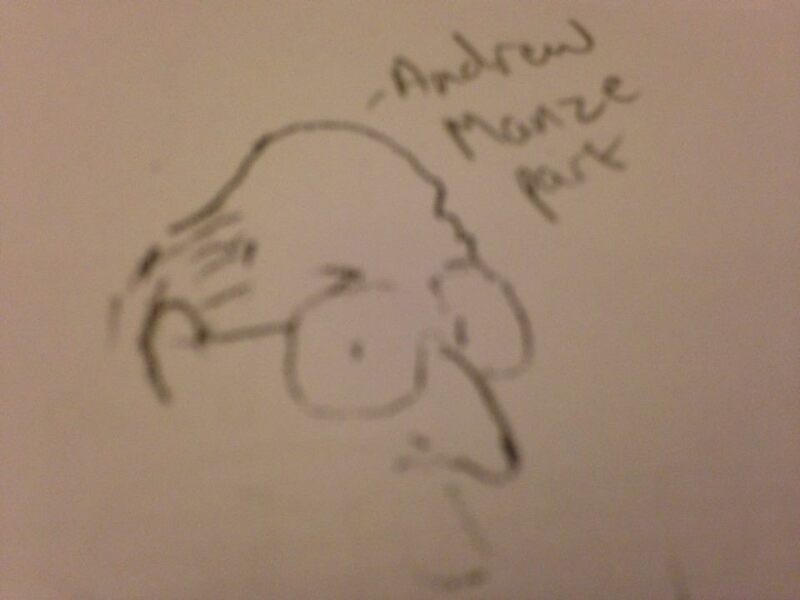 But whatever else the concert was, it was certainly a personal triumph for Manze. Schubert’s Third Symphony is the kind of piece that needs to be done with deep affection and understanding or not at all. Under Manze’s direction it was all energy and light: the first movement sprightly but still allowing room for genial exchanges, the second deliciously subtle but never self-regarding, the third full of Viennese cosiness but never tasteless, the finale fast but never overdriven. How difficult those “buts” are to achieve, yet how natural Manze and his musicians made everything feel. They carried this level of accomplishment over into Schumann’s Piano Concerto. Sadly Ronald Brautigam was not able to match it. He was certainly on top of the technical demands, but his playing was largely lacking in poetry, élan and fantasy. Perhaps he was determined to demonstrate that the first movement should not be excessively pulled around. In fact he only succeeded in draining it of affection (affettuoso is Schumann’s own marking), not helped by some undernourished tone production. After the interval, Manze’s own arrangement of the funeral march from Purcell’s Funeral Music for Queen Mary came and went without making much impact — a pity, because the idea of using the strings to suggest a kind of cathedral resonance was a good one. Even Britten’s well-known scoring up of the same composer’s Chacony in G minor felt slightly tokenistic, for all the dance-like momentum Manze injected into it. The undoubted glory of the concert was Mozart’s 40th Symphony. This was another marvel of transparent balance, airborne phrasing and sure instinct for dramatic highpoints. The genius of Mozart – far beyond the ken of the teenage Schubert – lies as much as anything in the moments of existential alarm that punctuate three out of the symphony’s four movements. Manze gave himself licence to highlight those passages with bold colours and nuances. He also ensured that the remaining movement – the so-called Minuet – carried equal weight, daring to place the Trio section in another world. The orchestra responded – as well they might – with consummate musicianship. This entry was posted in The Tour Blogs & Brendan's Solo Blogs and tagged 'RLPO', andrew, baroque, Britten, Conductor, David, fanning, friary, liverpool, Mahler, Manze, Mozart, of, orchestra, Paganini, philharmonic, Purcell, review, royal, schubert, schumann, the, violin, violinist. Bookmark the permalink.